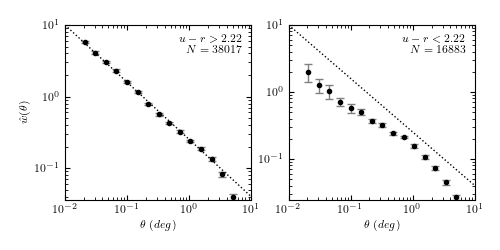 The N-point correlation function is a common technique used in astronomy to extract useful information from multi-dimensional datasets. This is especially true for spatial distributions of galaxies, because the theoretical description of the process of galaxy formation directly predicts the two-point correlation function. These are contrived examples, but they show how easy the computation can be. For a more realistic example, see the source code associated with the above figure.